Sara, Stina and Lina are playing together. But it’s not that easy to play three, there is always someone who is left out. Either the name is not right, or you make the wrong choice or you are just different. Playing three is a wonderfully cruel, funny and witty little reality show taken straight from the playground, describing the harsh facts of children’s everyday life. 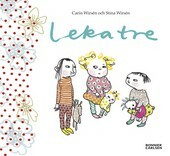 A new unforgettable picture book by the critically acclaimed creative team Wirsén.